All this may be wasted however, if you neglect the general upkeep and cleanliness of your fireplace. Ensure yours is always looking its best by following our tips on how to keep the area around your fireplace clean below. You can read our general fireplace/stove maintenance and cleanliness tips here. Today, instead of this, we are going to be talking about how to keep the area around your fireplace clean; so typically the mantle and surrounding areas. Allowing these areas to become messy will not necessarily pose a safety risk, nor will it damage the use of your fireplace. What it will do is dull down the aesthetic benefits of your fireplace and generally reduce its appearance. There are a few common habits that lead to the area surrounding your fireplace to become untidy, and we’re sure there are a few fireplace owners who will be all too guilty of these. Below, we have put together some of the most common crimes of the everyday fireplace owner, and our tips on how to rectify them. If you keep your logs beside your fireplace, you may fall into the trap of simply stacking them up on your hearth without a second thought. This in itself looks somewhat unruly, but what about when they’re (inevitably) knocked down too? 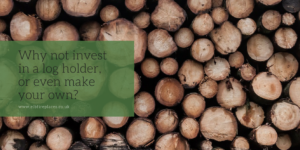 ELB’s tip: why not invest in a log holder, or even make your own? You could use an old table and nail on some more wood planks for a quick and easy log store, or what about even investing in a wall mount thats wide enough to hold your logs? Storing your wood beside your fireplace can make or break it, so ensure that you’re storing in both a practical and a stylish way. We will forever hone in on the importance of regularly cleaning your fireplace, or your stove for that matter. Not only for the maintenance benefits but also for the decorative benefits too. It can be far too easy to fall into the trap letting your fireplace cleaning slide, but if you do you can risk stunting the productivity of your fire and can risk it losing its aesthetic appeal. ELB’s tip: dedicate one day a week or biweekly to the fireplace clean and filter it into your everyday schedule. Before you know it, cleaning your fireplace will become second nature. Not only this, but regular upkeep and cleaning makes for an easier job than leaving dirt to build up over a long period of time and then having to tackle it in one big dreaded blitz. Hearths, mantelpieces and the areas around your fireplace (to some) provide an extra means for storage in the home. If you want your fireplace to boast those visually pleasing benefits as well as its practical benefits however, you should probably consider this. Using the mantelpiece to store everyday items such as letters, spare change, used mugs etc. can make it look cluttered and untidy – which’ll dull down its overall appeal. ELB’s tip: restrict who leaves what on the mantel, perhaps reserve the space for a small ornament or a candle only to harness a minimalistic and stylish design. If you’re finding yourself unsure with what to do with the items that once resided on your mantle, then how about investing in a wooden storage box that could live next to the fireplace? If you invested in one that was big enough, and with two compartments this could even double up as a log store. If you’ve fallen victim to the taboo of not keeping the area around your fireplace clean, then fear not – you can easily follow these tips to have your fireplace looking brand new in no time at all. 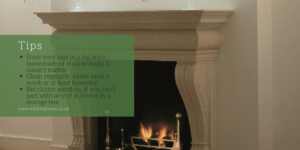 For more on all-things stoves and fireplaces, head over to our blog; or get in touch with us today for any queries.